Posted April 4th, 2018 | Category: Applian Software, Replay Capture Suite. The 2018 Major League Baseball season is well underway, and we’re taking stock of some of the best ways to engage and get more out of every last game. With awesome developments like augmented reality experiences, live streaming games on social channels, personalized games, and tried-and-true fantasy leagues, there are endless ways to get your fill of MLB. Another cool tech solution for baseball fans? Apps, apps, apps! Whether you’re a diehard fan or a newcomer to the community, you can make the 2018 MLB season even better with the help of a few key applications. CBS Sports is one of our go-to resources for all things MLB, and unsurprisingly, the CBS Sports mobile application is a crowd-pleaser for baseball fanatics everywhere. With live scores of every game, a full news feed to provide real-time updates, and even a tweet feed to keep the conversation flowing in your community, it’s one of the most popular solutions for tracking games and getting stats. Bonus! You can even get wireless alerts set up so you receive photo and video updates via text and never miss a thing. Get Replay Video Capture here. MLB At Bat is the official app of Major League Baseball, providing a mobile platform for news, videos, box scores, and recaps of every game – you can even select your top teams for lightning-fast access to specific information and live game scores. 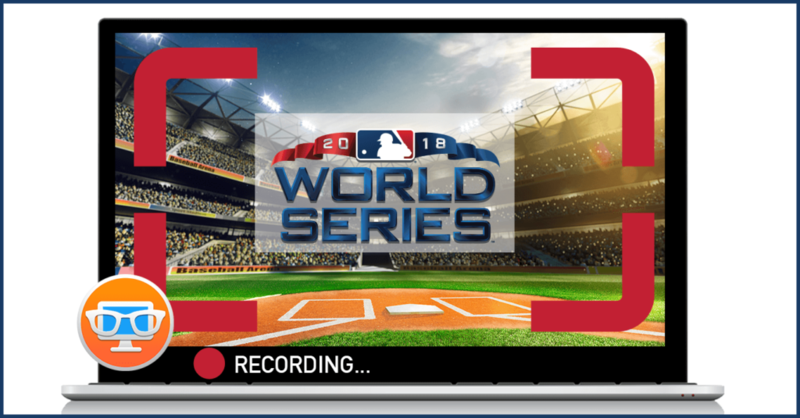 Free for any current subscriber of MLB.TV, the mobile app is one of the best ways to get in-depth coverage of your favorites from the beat reporters who live and breathe them. Get MLB At Bat here. No matter which app solution is right for your MLB experience, Replay Video Capture is here to help save every last game. Replay Video Capture is the easiest way to capture any baseball game on your screen and turn it into a high quality, video movie file. Make personal copies of your favorite MLB Playoffs games and keep them forever, in whatever format you want. Learn more about how it works or get a free trial before the season is over!